In one of my other blog posts, I wrote about not making snap judgements about a brand because the cigar fell apart or didn’t burn evenly. I’m glad i took my own advice and tried the La Jugada Habano again. However, this wasn’t love at first puff … but, in any relationship, sometimes you gotta give a little. The cigar has a nice appearance with a strong pre-lit tobacco and pepper scent. The first puffs yielded a very strong, powerful, full profile. If you know anything about me, I enjoy a medium plus multidimensional smoke. 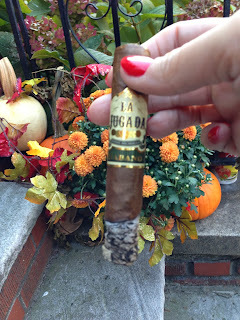 The Habano had a very spicy, strong tobacco, earthy flavor with some sour notes that i immediately didn’t enjoy. I smoked a bit more through the first 1/4 and almost snuffed this one out. There was lots of smoke, thick, full flavor. The ash stayed on during the first 1/3. But when the ash fell, WOW, what a change in the flavor profile! The 2/3 profile changed to medium, earthy, pepper was in background but an overwhelming sweet flavor emerged. The sweetness was present on my lips & in my mouth with another dimension of flavor similar to cloves or ginger ( think pumpkin pie spice). These flavors stayed throughout the remainder of the cigar till the end when a roasted almond flavor appeared and balanced the cigar nicely. I’m surprised at my enjoyment of this cigar, considering the rocky relationship we had in the beginning. But overall, when it came down to it, I didn’t want this little bit of love to end. I was sitting outside as the sun was setting and a chill was developing — but i didn’t want to put down my Habano. It was THAT good. Burnt Fingers all the way here.